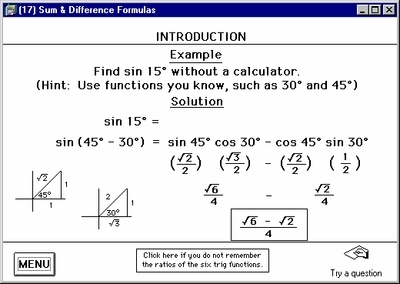 Trigonometry Software(Part 1):This software program is designed for students having completed high school algebra and geometry. From Menu #1 students will first review Right Triangle Geometry, followed by the study of the Unit Circle, Radians & Degrees, Reference Angles, the six trig functions, Amplitude, Period, Phase Shift, and Inverses. From Menu #2 students will learn the formulas and applications for the Length of an Arc, Conversion Factors, Angular Velocity, Linear Velocity, Area of a Circular Sector, and Area of a Circular Segement. The Vocabulary section provides the student with a quick click review of key topics. 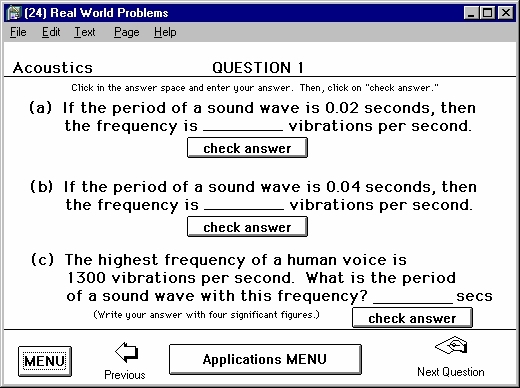 The program concludes with a 30-question test which is printable with or without solutions. Advanced Trigonometry Software (part 2): Continue your study of Trigonometry with the following topics: Trig Identities, Trig Proofs, Double Angle Formulas, Half Angle Formulas, Sum & Difference Formulas, Expressions & Equations, Solving Right Triangles, The Law of Cosines, The Law of Sines, Area of a Triangle, Vectors, Real World Problems, Polar Coordinates, and DeMoivre's Theorem. This program concludes with a 30-question test printable with or without solutions. This bundle offers you a reduced price on the purchase of BOTH Trig (Part 1) and Trig (Part 2). Available for immediate download.